A Creative MuVo, a small solid-state MP3 player in a keydrive form-factor. An MP3 player or Digital Audio Player is an electronic device that can play digital audio files. It is a type of Portable Media Player. The term 'MP3 player' is a misnomer, as most players play more than the MP3 file format. Since the MP3 format is widely used, almost all players can play that format. In addition, there are many other digital audio formats. Some formats are proprietary, such as MP3, Windows Media Audio (WMA), and Advanced Audio Coding (AAC). Some of these formats also may incorporate digital rights management (DRM), such as WMA DRM, which are often part of paid download sites. Other formats are patent-free or otherwise open, such as Vorbis, FLAC, and Speex (all part of the Ogg open multimedia project). MP3 technology started in Germany in the year 1987. German Company named Fraunhofer-Gesellschaft started the research program for coding music with the high quality and low bit rate sampling at its institute. The project was controlled by an expert in mathematics and electronics, Karlheinz Brandenburg. Then in 1997, Tomislav Uzelac who was an employee of Advanced Multimedia Products Company, made the first successful MP3 player after Frauenhofer’s MP3 became a disaster. Seven years later, He managed to produce and release his MP3 in the US markets. This was the earliest Portable player and was known as AMP MP3 Playback Engine. The first MP3 player was developed by SaeHan Information Systems in 1997. Nevertheless, the first one on the American market was the Eiger Labs F10, a 32MB portable that appeared in the summer of 1998. It was a very basic unit and wasn't user expandable, though owners could upgrade the memory to 64MB by sending the player back to Eiger Labs with a check for $69.00 + $7.95 shipping. The second MP3 player needed was the Rio PMP300 from Diamond Multimedia, introduced in September 1998. The Rio was a big success during the Christmas 1998 season as sales significantly exceeded expectations, spurring interest and investment in digital music. The RIAA soon filed a lawsuit alleging that the device abetted illegal copying of music, but Diamond won a legal victory on the shoulders of Sony Corp. v. Universal City Studios and MP3 players were ruled legal devices. Eiger Labs and Diamond and went on to establish a new segment in the portable audio player market and the following year saw several new manufacturers enter this market. Other early MP3 portables include Sensory Science's Rave MP2100, the I-Jam IJ-100 and the Creative Labs Nomad. These portables were small and light, but only held enough memory to hold around 7 to 20 songs at normal 128kbit/s compression rates. They also used slower parallel port connections to transfer files from PC to player, necessary as most PCs then used the Windows 95 and NT operating systems, which did not support the then newer USB connections, at least well. As more users migrated to Win 98 by 2000, all players went USB. 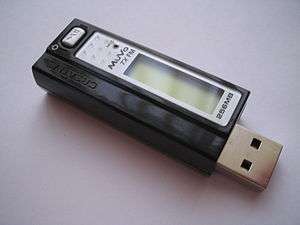 At the end of 1999, a company called Remote Solutions significantly broke that barrier by utilizing a laptop drive for song storage rather than low capacity flash memory. The Personal Jukebox (PJB-100) had 4.8GB, which held about 1200 songs, and invented what would be called the jukebox segment of digital music portables. This segment eventually became the dominant type of digital music player. Devices that play CDs. Often, they can be used to play both audio CDs and homemade data CDs containing MP3 or other digital audio files. Pocket devices. These are solid state devices that hold digital audio files on internal or external media, such as memory cards. These are generally low-storage devices, typically ranging from 128MB-1GB, which can often be extended with additional memory. As they are solid state and do not have moving parts, they can be very resilient. Such players are generally integrated into USB keydrives. Devices that read digital audio files from a hard drive. These players have higher capacities, ranging from 1.5GB to 100GB, depending on the hard drive technology. At typical encoding rates, this means that thousands of songs—perhaps an entire music collection—can be stored in one MP3 player. Apple's popular iPod player is the best-known example. Generally speaking, MP3 players are portable, employing internal or replaceable batteries and headphones, although people are increasingly hooking players up to their car and home stereos—sometimes via a wireless connection—thereby turning them into portable jukeboxes. Some MP3 players also include FM radio tuners . Devices such as CD players can be connected to the MP3 player (using the USB port) in order to directly play music from the memory of the player without the use of a computer. Modular MP3 keydrive players are composed of two detachable parts: the head (or reader/writer) and the body (the memory). They can be independently obtained and upgradable (one can change the head or the body; i.e. to add more memory). ↑ Anonymous. "Invention Story of MP3 Player". www.engineersgarage.com. Retrieved 2016-03-31. Collecting MP3 Portables – Part I – Richard Menta's article covers several of the first MP3 players on the market. With pictures of each player. Podcasting News – has info on using MP3 players to receive podcasts, and a Podcast Directory.